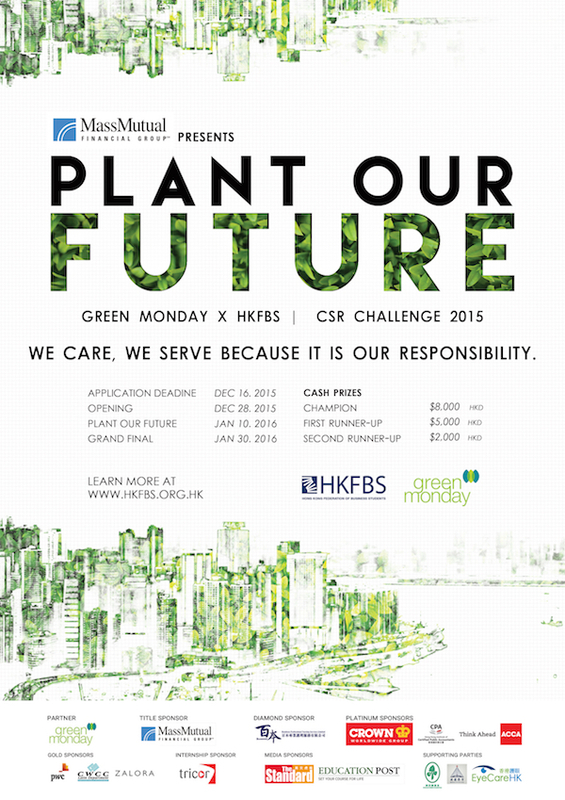 CSR Challenge 2015 - Plant Our Future is a brand new function which aims at unleashing university students’ potential to contribute to the society and to raise students’ awareness towards corporate social responsibility. HKFBS will establish cordial communication and relationship with other kindred organisations and the community. HKFBS is the leader among business student societies that advocates Corporate Social Responsibility. This year, we are honoured to cooperate with Green Monday through organising workshops and campaigns to our members to raise their awareness towards social problems such as global warming, green life style, etc. The whole project targets teams from 9 local universities and different Advisory Companies who can make use of their professional knowledge to create new ideas which can benefit the society. CSR Challenge 2015 - Plant Our Future consists of 5 components, namely Opening Workshop, Plant Our Future, Promotion Challenge, Campus Challenge and Closing Ceremony. Each element is connected and accompanied with relevant activities to reach the goal of organising various CSR events. The whole assessment process will be conducted by the Evaluation Committee from Business Field.